The Google/Digg acquisition negotiations were in full swing as of last Tuesday, had passed the term sheet stage and the two companies were in final negotiations in the $200 million range. But sometime this last week Google decided to walk from the deal. Digg was notified on late Thursday or Friday. 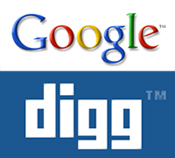 Google was in the due diligence stage of the deal, where they peer deep into Digg’s technology and financial statements. Most term sheets are non binding, so anything that gives the buyer pause can be used as an excuse to walk away – but generally the buyer already has a very good idea what they are getting well before the term sheet stage. Two sources close to the companies suggested that some issue that came up during technical due diligence was to blame. One source said that the issue was more personality driven, and that Google decided after spending more time with Digg’s top team that there just wasn’t a fit. Either way the deal appears to dead and can be added to the long list of failed Digg acquisition deals. And when a company is “left at the altar” other buyers are usually hesitant to step in. So what will Digg do now? We’re hearing they’ll just push through with a new round of financing. Digg hired Allen & Co. to represent them in the sale, but the investment bank is just as good at closing massive venture financings, too (they represented both Slide and Ning in their recent a half billion dollar valuation financings).